Let’s start with a full disclosure: At different points in the last 8 years I have used Facebook as a social space, an event planner, a (ahem) dating site, a forum for circular political debates and (from 2007 until 2010) a repository for out-of-context song lyrics. For almost a third of my life, I have liked, shared, poked, messaged and Farmvilled. Facebook has become entangled in my life in ways that would be embarrassing to admit if everybody else weren’t already in the same bind. Maybe you don’t “do” Facebook, but I don’t think I’m an outlier. There are over a billion users. Redshirt is being released during the latest peak in the ongoing conversation about Facebook as a symptom or cause of society’s ruination. To blame for this round of Salon think-pieces is Dave Egger’s novel The Circle, which, like Redshirt, is a satirical look at social media. Redshirt is designed by Mitu Khandaker who, I suspect, has spent some time on Facebook—unlike Eggers. Eggers went for smug finger wagging at strawmen; Khandaker built a simulation of Facebook that slowly turns you into the worst version of yourself. Life simulations, the genre Redshirt falls into, let the player guide a character towards a fulfilling life. Each game presents a very different idea of what a fulfilling life is, and how one would get there. The most popular game in the genre, The Sims, has “happiness” as its ultimate goal: play it for a few minutes, and it will become clear what the designers’ idea of happiness is. If you’re happy, you can do well at work, so you can get promoted, so you can make money, so you can buy more stuff, which will help you be happier, which leads to another promotion … this goes on and on. If played “correctly,” the dream life in The Sims is a comfortable middle class existence. It is one of the best-selling PC games of all time. Redshirt is set in a far future reminiscent of Star Trek mixed with a pastiche of sci-fi’s greatest hits. You create a Spacebook profile for a lowly ensign on a backwater station and try to navigate the social world of the station. 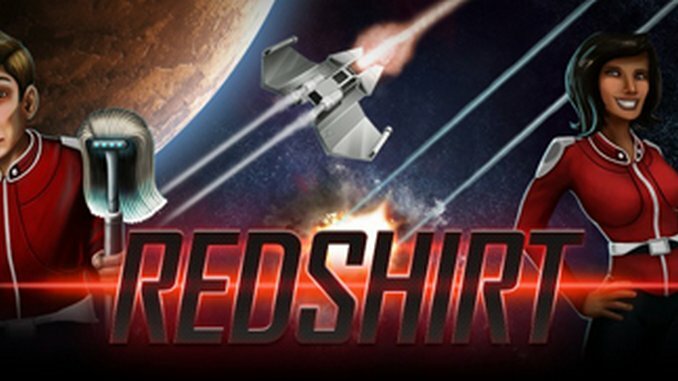 Redshirt having been designed to mimic Facebook (while not, I should stress, actually being a Facebook game) means most of the game will feel intuitive to Facebook users and a bit overstuffed for everybody else. There are a limited number of actions—such as liking statuses, sending messages, and planning events—that can be performed over the course of one in-game day. As time goes on, your character gains skills that help them advance at their job, while also cultivating a set of interests that help them socialize with their Spacebook friends. The main tension in Redshirt, and all life sims, really, is making the most of limited time. The irony being, we have to manage our time with the activity we use to waste it. 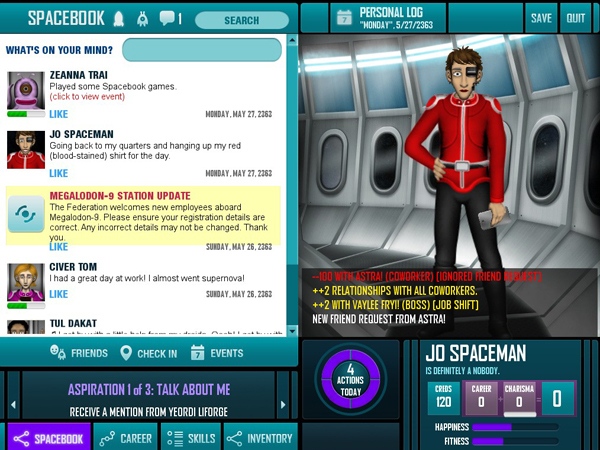 A pulsing paranoia runs through Redshirt: every action on Spacebook is visible to all the other characters in the game. People will refuse events because of who else is going. Gelatinous cubes feel neglected, and demand a quick bon mot on their wall instead real contact. Every action is watched or has the potential to be watched. It’s not a vision of Facebook as it exists, but the one that spurred millions to learn the nuances of privacy control. It feels good to play, to push back against this a bit. Redshirt creates such an oppressively passive aggressive world that leaving a nasty insult on somebody’s wall in-game feels like jumping into a fast car in GTAV and driving on the wrong side of the road. Most games in the life sim genre would punish you for playing incorrectly, but Redshirt thrives on transgressions. Don’t let the charming, low-key tone and gentle referential humor fool you, this is pitch black stuff. The long-term goal in Redshirt is to get off the station. Working your way up to command, gaining enough money to buy a ticket off the station, or even dating a senior officer can work. Complicating this goal are random, dangerous missions that your character cannot avoid. A selection of crew members will be called to action for these missions, and a little animation will show who’s been killed off afterward. One such mission can propel an enemy into management, or kill off the officer you’ve been schmoozing. My knowledge that anybody could die—myself included—caused me to start playing Redshirt like a psychopath. Relationships became transactional and interchangeable to me, like mere resources to be mined and chucked aside. I could charm the boss, invite them out to events, friend them, and then, after the promotion, let them languish on a roster of friends that I barely thought of again. Every push towards a new rank in my character’s career brought along a new social circle. It felt good to emerge as a social butterfly, shedding the old friends and the complications that come with staying in one place too long. In the world of Redshirt, everybody is equally needy and vain. All of the wall posts are automatically generated by the game, and if played long enough, they repeat over and over again. My character’s timeline became an echo chamber of the same thoughts and navel gazing. Private messages are constructed by selecting each line for a selection of lines that range in tone. There is no real nuance to these interactions, only broad generalities. These are all the worst bits, of myself and of Facebook: the push towards less privacy, towards superficial relationships and walls of meaningless birthday greetings. Redshirt is a version of social media without, you know, the social part. It is the ultimate form of solipsism. If most life sims are imperfect reflections of life, Redshirt is, instead, an imperfect reflection of Facebook, itself an imperfect reflection of life. I am in a hall of mirrors and all I see is myself. Filipe Salgado works at a bank, but he’s not all bad. Sometime he writes for Kill Screen or writes stories about the deserts of the American Southwest on his blog Big Talk, Real Slow. You can also follow him on Twitter @philthe25th.